The Philippines experiences only two distinct seasons (sunny and rainy), and as the summer season begins to wind down, torrential rainfall will again be experienced in the tropical country for the next few months. Preparation now can prevent — or at least lessen problems — ahead of Philippines’s possible rainy or worse stormy days. 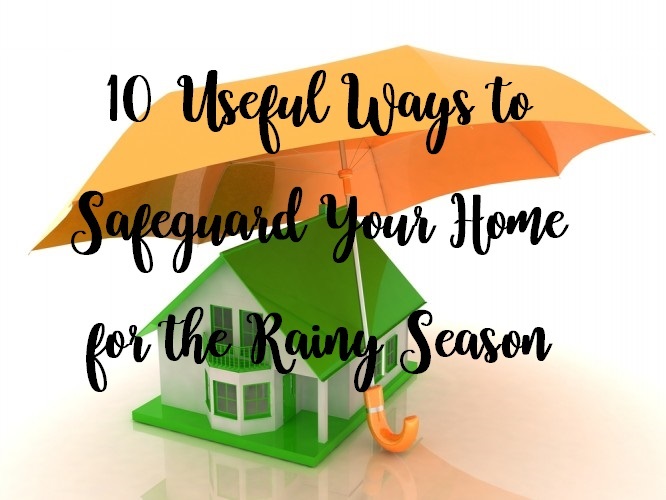 Here are some ways you can prepare your home for the rainy season in order to keep you and your family warm and dry. The key to ensuring you and your family remain safe and dry during the raining season begins at the roof of your house. The roof is the part of your home that works heavily in protecting you from the elements. Make sure you have thoroughly checked your roof for cracks. Keep in mind that this includes evaluating the ceiling from the inside as well. Your home's gutters help catch rainfall and ensure that it stays far away from the foundation of your home. However, they can get clogged with leaves and other debris, which can lead to overflowing and pooling of water that weigh down on the roof. Clean gutters by spraying a hose through them from the bottom up. You can also use a trowel to scoop out anything that's clogging your gutters, or purchase a cleaning tool specifically designed for your gutters and attach it to your hose. Before the rainy season begins, it's crucial that you check your home for signs of leakage. It's best to fix a leak early on, as leaving it to worsen could result in flooding, mold and mildew, and even collapsed ceilings. Scan your ceilings for water marks and look for peeling paint. You should also venture outside of your home and look at your roof for telltale signs. Check out the ridges and see if there are any cracks. Look for loose, curled or missing shingles, which can signal roof damage and allow water to enter the home. Aside from your roof, your windows and doors are the most common points where rainwater enters your home. Make sure that they open and shut properly and that they're completely sealed. Even a tiny gap that can't be seen might let in some water if you're not careful. This not only helps keep you better protected from the outside, but also assists in the energy efficiency of your air-conditioning or thermostat that you use indoors. If your windows are on the newer side, you might not have to worry about sealing them, but older ones should definitely be inspected. While your area may not be prone to floods, an ounce of prevention is always better than a pound of cure. Make sure all drains within and around your home are fully functional, without any blockages that can cause water to collect and result in extensive damage, become a physical hindrance, or turn into breeding grounds for insects and other parasites. When it comes to the potential of flooding, it's better to be safe than sorry. Make a few tweaks to the inside of your home so if the worst does occur and you get water in your home, the damage is minimal. Keep electronics high off the floor and place them far away from windows. Consider mounting your television if it's not already, and keep laptops and tablets stored on shelves that won't be affected by water that might find its way inside your home. Keep mops within reach, and consider investing in a water vacuum if you expect flooding to occur. A house is not a home without you or your loved ones, so your safety and well-being are of the utmost importance during the rainy season. Be rain-ready along with your property by having an emergency preparedness kit handy, particularly during times of typhoons and other natural calamities. A basic kit should include three gallons of potable water per person, a three-day supply of non-perishable food, a first-aid kit, a tool kit to open cans and turn off utilities, a flash light with extra batteries, and a whistle to signal for help. If storage space permits, this should also include wet wipes, mosquito repellent, garbage bags, and plastic ties for personal sanitation, a battery-operated radio for news updates, and a working mobile phone with a lengthy battery life. If you notice any faulty or worn-out wiring, it’s best you call an electrician to fix these ASAP. The last thing you want is anyone getting electrocuted or shocked when the heavy rains come. For extra safety, buy a few surge protectors to protect your appliances and gadgets that may be affected in the event that lightning strikes unexpectedly. Once your home is protected from the rainy elements, you can kick back and relax. Many find the rain to be soothing and peaceful, so capitalize on that feeling and prepare for a nice, lazy day.